UYEE provides rapid prototyping services and new product manufacturing with more than 13 years in this field and serve the clients who are from global of many type of fields. Such as: automotive, medical devices, kitchen product, aerospace. When custom-made parts are required in small order quantities. We assure high-quality parts and fastest turnaround times in the industry. As one of top rapid prototyping companies, we allow you to have a working model of your prototype in your hands before going into production. Test, critique, feel, and check your design before it is too late. Show your clients a physical object, not a computer screen. Minimum commitment, maximum results. Have your design in hand within a few days. At UYEE our comprehensive production capabilities and widely industry knowledge allow us to partner with clients looking for new product development and engineering services. These skill sets are mated with our years of real world rapid manufacturing experience, and can deliver comprehensive solutions, and a clear cost effective development and manufacturing path. Our product development and prototype making, engineering service consists of consultation, design-for-manufacturability, full product development and design, building, prototyping, manufacturing, comprehensive project management, and reverse engineering design. 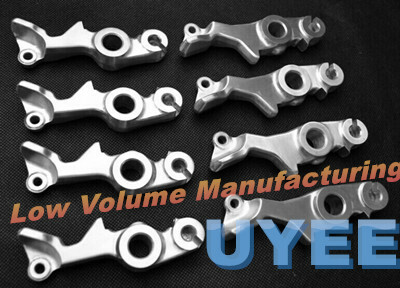 From mechanical CAD-based, CAM-based, and CNC programming to complete manufacturing, finishing, assembly, QA, and warehousing services, at UYEE we can do what others can’t: completely manage the production and delivery of parts and products direct to your inventory or clients, these services are highly cost-effective, and a definite pathway for centralized production and a stronger competitive edge. We provide a wide range of rapid prototyping and precision CNC machining services in short lead times. Some of these include thread milling, external threading, contour turning, countersinking and counter boring, etc. Our advanced CNC machining capabilities enable us to produce one to several hundred parts easily. All rapid prototype machined parts are inspected, packed, and shipped immediately after manufactured. Our factory have 13 years of Custom CNC machining experience, we provide Precision CNC Machining, CNC Milling, CNC Turning Services and Value Added Service. And suit low to high volume and a series production of machined parts. A vast variety of materials can be machined, including stainless steel, aluminum, magnesium, zinc, brass…etc. We can help our clients with solving challenging CNC machining projects. Weld and Finished, such as: Polished, Brushed, Anodized, Powder Coating….etc. a) Quick turn Services Guaranteed: Our CNC machines enable super-speed manufacturing. These machines have excellent tool changer capacities and are equipped with spindles providing 15,000 RPM. Our technical advantage combined with our vast industry experience, enables us to ship parts in as little as 1 to 3 working days. b) No Limitations on Materials: We work with a wide range of materials, and can work with any complex shape of parts. We know how to transform complex geometrical designs to full working parts easily. Our vast experiences with diverse shapes, sizes, and materials have helped us grow into a one-stop shop for all industrial prototype building needs. c) Proactive Approach to Parts Optimization: We combine our widely subtractive manufacturing experience with our state-of-the-art manufacturing processes to make high quality prototypes. Our experts always suggest designs that help our clients to cut down production costs without compromising on the quality. We help our clients to have an easy transition to production. We are committed to delivering you quality components that your project deserves. Honesty – We expect honesty at all times. Skilled workforce – Ongoing training and apprentice program to develop the next generation of skilled workers. So training is important on our team. Strong work ethic – Essential for success. Healthy workforce – Wellness programs and education help keep our team healthy and working for you. Greatly improve production efficiency. Respect – You deserve and will be treated with respect when you work with us. No matter what clients place an order with small amount or big amount. Trust – We maintain a high-trust environment, with only trustworthy employees on our team. Excellent communication – Proactive, clear communication is expected with our teams and our clients. Company reinvestment – State-of-the-art equipment and diligent preventative maintenance. Fun – We would like all our team members to have fun and enjoy their job, and we do! For more information on our rapid prototype services, contact us today. Or Request a Quote to receive competitive pricing. Please mention the expected delivery time. This will help us to serve you the best. UYEE provides rapid prototyping services and new product manufacturing with more than 13 years in this field and serve the clients who are from global of many type of fields. Such as: automotive, medical devices, kitchen product, aerospace.